-CAM21_CUTX2 - SONY STARVIS(r) Series 1/2.8" IMX290 Sensor based Full HD Camera for NVIDIA(r) Jetson TX2, Uncompressed image streaming Full HD - 1080p @120fps ST. LOUIS, USA and CHENNAI, India - Jan 24, 2018, e-con Systems Inc., a leading imaging solutions company and NVIDIA(r) Preferred Partner announces the launch of the much-awaited SONY STARVIS(r) series IMX290 CMOS Sensor based MIPI CSI-2 camera module for NVIDIA(r) Jetson TX2 developer kit - e-CAM21_CUTX2. The STARVIS(r) is back-illuminated pixel technology used in Sony CMOS image sensors for Smart Surveillance camera applications. Its excellent low-light sensitivity realizes high picture quality in the visible-light and near infrared light regions. e-CAM21_CUTX2 produces outstanding visibility under the starlight. The IMX290 is a RGB 10/12-bit Bayer format image sensor that can stream 1080p @ 120fps. e-con Systems partnered with NVIDIA(r) to develop this camera leveraging the powerful Image Signal Processor of NVIDIA TX2. e-con Systems worked closely with NVIDIA on the driver development, image sensor characterization and ISP tuning for realizing excellent image quality under various lighting conditions including near darkness. The e-CAM21_CUTX2 camera is an ideal camera for smart applications powered by Machine Learning and Deep Learning technologies on the powerful Tegra X2 platforms including smart surveillance, smart parking and other innovative applications requiring cameras with excellent image quality. The distinguishing feature of e-CAM21_CUTX2 is its capability to realize stunning images at absolute darkness. This has been possible with high level of image quality tuning for this sensor on the ISP of Tegra X2. Another highlighted feature of this sensor is its sensitivity in the near IR region of the light spectrum. Hence, this camera can be used for capturing images using IR lighting. NVIDIA Preferred Partner, e-con Systems has pioneered in bringing out various cameras for NVIDIA Jetson TX2 kit. Earlier, e-con Systems had launched e-CAM30_HEXCUTX2 - Six Synchronized Full HD Cameras, e-CAM131_CUTX2 - 13MP UltraHD camera, 4MP RGB-IR camera, e-CAM31_TX2 - 3.4 MP Liquid Lens Autofocus camera and e-CAM30_CUTX1 - 3.4MP low light sensitive camera boards for NVIDIA Jetson TX1/TX2. The e-CAM21_CUTX2 Full HD Camera Module interfaces with the TX2 processor over 4-lane MIPI CSI-2 interface. e-con Systems has developed the V4L2 media-controller sensor kernel driver API based camera drivers, on top of JetPack 3.1 version from NVidia. JetPack 3.1 features new APIs for efficient low-level camera and multimedia streaming with Jetson TX2, alongside updates to Linux for Tegra (L4T) R28.1 with Ubuntu 16.04 aarch64 and Linux kernel 4.4. The e-con's e-CAM21_CUTX2 + TX2 ISP, exposes the standard camera controls such as exposure, brightness, contrast, saturation, white balance, gamma, gain, sharpness, etc. through the NVIDIA's 'libargus' APIs. The e-CAM21_CUTX2 is provided with the S-mount (M12) lens holder which allows customers to choose and use the lens according to their requirement. This Starlight camera uses NVIDIA's on-board Jetson TX2 Image Signal Processor (ISP) to perform all the Auto functions (Auto White Balance, Auto Exposure control) and significantly, improved image quality. The e-CAM21_CUMI290_MOD supports 4-lane MIPI CSI-2 interface for video transport and the standard I2C interface for camera control. Through the 4-lane MIPI CSI-2 interface, this camera supports Full HD (1080X1920) video streaming RBG 10 bit at 120 frames per second. e-CAM21_CUTX2 is currently available for evaluation. Customers interested in evaluating the e-CAM21_CUTX2 with on NVIDIA(r) Jetson TX2 developer kit can order samples from e-con Systems' online store. For more information, please visit the product page of 2MP Sony Ultralow light full HD Jetson TX2 Camera Board or watch demo of e-CAM21_CUTX2. e-con Systems Inc., NVIDIA's Scaling partner, specializes in the design, development, manufacture of embedded OEM CMOS USB 3.0/USB 2.0 cameras, board cameras (MIPI/Parallel), Stereo cameras . 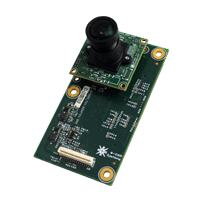 We provides extensive range of high quality CMOS cameras (ranging 1 MP to 13 MP) based on Sony, ON Semiconductor and Omnivision sensors for various processors from NVIDIA, NXP(Freescale),Texas Instruments, etc. e-con Systems has strengths in customized product design and can offer fast prototyping and custom modification in hardware and software for any application. -CAM21_CUTX2 - SONY STARVIS(r) Series 1/2.8\" IMX290 Sensor based Full HD Camera for NVIDIA(r) Jetson TX2, Uncompressed image streaming Full HD - 1080p @120fps ST. LOUIS, USA and CHENNAI, India - Jan 24, 2018, e-con Systems Inc., a leading imaging solutions company and NVIDIA(r) Preferred Partner announces the launch of the much-awaited SONY STARVIS(r) series IMX290 CMOS Sensor based MIPI CSI-2 camera module for NVIDIA(r) Jetson TX2 developer kit - e-CAM21_CUTX2. The STARVIS(r) is back-illuminated pixel technology used in Sony CMOS image sensors for Smart Surveillance camera applications. Its excellent low-light sensitivity realizes high picture quality in the visible-light and near infrared light regions. e-CAM21_CUTX2 produces outstanding visibility under the starlight. The IMX290 is a RGB 10/12-bit Bayer format image sensor that can stream 1080p @ 120fps. e-con Systems partnered with NVIDIA(r) to develop this camera leveraging the powerful Image Signal Processor of NVIDIA TX2. e-con Systems worked closely with NVIDIA on the driver development, image sensor characterization and ISP tuning for realizing excellent image quality under various lighting conditions including near darkness. The e-CAM21_CUTX2 camera is an ideal camera for smart applications powered by Machine Learning and Deep Learning technologies on the powerful Tegra X2 platforms including smart surveillance, smart parking and other innovative applications requiring cameras with excellent image quality.